One of the most requested posts in last months was the Milan tips. Before heading to the fashion capital of Italy, I googled like crazy for tips, advice and interesting places to see. And didn’t find much. That’s why I decided to write you some of my tips, what I liked about the city and what is worth visiting. There are many low-cost airlines, that you can flight with to Milan. If you are booking in advance, the prices are very very low. We booked our tickets kinda last minute (because the whole trip to Milan was kinda last minute decision) and the price wasn’t very high neither. We flew with Wizzair, which takes you to the Bergamo airport (there are 3 in the city), which is located about 50 km away from the city centre. There are also several buses going to the city centre for ca. 8 euros. Traveling itself is stressful, at least for me. What we had difficulties with, was finding a hotel room. The hotels were either very very expensive or very very cheap - but only a few in between. In the end we stayed at Enterprise Hotel, which I can only recommend! Milan isn’t a very big city, so it is not necessary to use the subway all the time. We walked a lot, because all sights are near the centre. Most of the time we bought an one-ride ticket, because as said, we walked a lot. Also I used the app “Uber” a lot, that helped me take me to the fashion shows on time. Besides, if you download the app, sign-up and you the code FASHIONINMYSOUL, you’ll get your first ride for free! Do Milána létá hned několik nízkonákladových leteckých společností. Letenky se dají sehnat i za 800Kč, když je zabookujete dopředu. Náš výlet do Milána bylo rozhodnutí na poslední chvíli, takže nás letenka tam a zpět vyšla zhruba na 2500 Kč. Letěli jsme se společností Wizzair na Aeroporto di Milano-Bergamo. V Miáně jsou pak další 2 letiště. Konkrétně Bergamo leží zhruba 50 kilometrů od centra, kam se dá dojet autobusem za 8 euro. S čím jsme ale měli problém, byl hotel. Když jsme ho hledali my, našli jsme jenom hodně, hodně drahé nebo hodně, hodně levné, ale najít hotel “mezitím” bylo opravdu těžké. Také jsme letěli ve fashion-weekové sezoně, takže hotely byly přeplněné a ceny tak šly nahoru. Nakonec jsme bydleli v Enterprise Hotel, který můžu jen doporučit. Co se dopravy týče - Miláno není extra velké, takže se dá projít pěšky. Metrem jsme jezdili minimálně, takže jsme si většinou kupovali jenom jednorázový lístek. Hodně jsem pak využívala i aplikaci “Uber”. Jedná se o osobního řidiče, který Vás doveze odkud chcete tam, kam potřebujete. A vychází mnohem, mnohem levněji než klasický taxík. Navíc, pokud si aplikaci stáhnete, zaregistrujete se a použijete kód FASHIONINMYSOUL, budete mít první jízdu zdarma (jezdí i u nás v Praze a v daších zemích)! Milan is a city, which offers a lot to see. There are many beautiful buildings in the centre, but also a lot of sights. The most famous one is the Duomo, located in the heart of Milan. So definitely go there and get a picture! Also there is an amazing view over Milan from the top of Duomo! A few meters away is the Galeria Vittorio Emanuele with the beautiful interior and a lot of luxury shops (such as Louis Vuitton, Prada, Gucci, etc.) inside. Another sight worth seeing is Castello Sforzesco and Arco della Pace a few minutes walking away. V Miláně je toho k vidění opravdu požehnaně. V centru najdete krásné, archetonické domy a i spoustu památek. Tou nejznámější je Duomo (katedrála), přímo v centru města. Doporujčuji jít i dovnitř a hlavně si zaplatit vstup na střechu katedrály, odkud je nádherný výhled na celé Miláno. Pár metrů od Duomo je Galeria Vittorio Emanuele, kterou byste taky neměli vynechat. Kromě krásného interiéru v ní najdete i spoustu (předražených) kaváren, restaurací a luxusních obchodů (jako je např. : Louis Vuitton, Prada nebo Gucci). Dále bych pak doporučila Castello Sforzesco a Arco della Pace jen pár minut pěšky od zámku. Milan is the shopping-Mekka. Most of the world-famous designers are originally from Italy, so is a lot of their stores. If you are looking for luxurious stores, definitely go to Via Monte Napoleone, where you’ll find all luxurious stores (LV, Gucci, Prada, Celine, Dior, Saint Laurent, etc.). Also as mentioned before, some luxury stores are located also in the Galeria Vittorio Emanuele. In the centre there is also a department store called La Riascemente, where you'll find a lot designers too. The more affordable stores, such as &otherstories or American Apparel are located on Corso Vittorio Emanuele II a Costo di Porta Ticinese. Miláno je město módy, takže není divu, že je i nakupovacím rájem. Pokud hledáte luxusní obchody, určitě zajděte na Via Montenapoleone, kde najdete například obchody Celine, Louis Vuitton, Prada, Saint Laurent, Dior, … Pár obchodů s luxusním oblečením najdete i v Galleria Vittorio Emanuele a nebo v nákupním domě La Riascemente. Obě se nachází přímo v centru. Cenově dostupnější obchody, například moje oblíbené &otherstories nebo American Apparel, jsou pak na Corso Vittorio Emanuele II a Costo di Porta Ticinese. In Milan there are restaurants and cafes on every corner. I am a macaroon lover, so when visiting a city where is a Ladurée store, I have to go there. The Ladurée in Milan is located on Via Spadari. What you have to try, is the italian Gelato! We tried the Cioccolati italiani one and I can only recommend it! The prices aren’t that high, they have a lot of flavours and the gelato was simply delicious. Another thing I am obsessed about, is cafes. I am an coffee lover, so I am always try to find the best cafes in town. 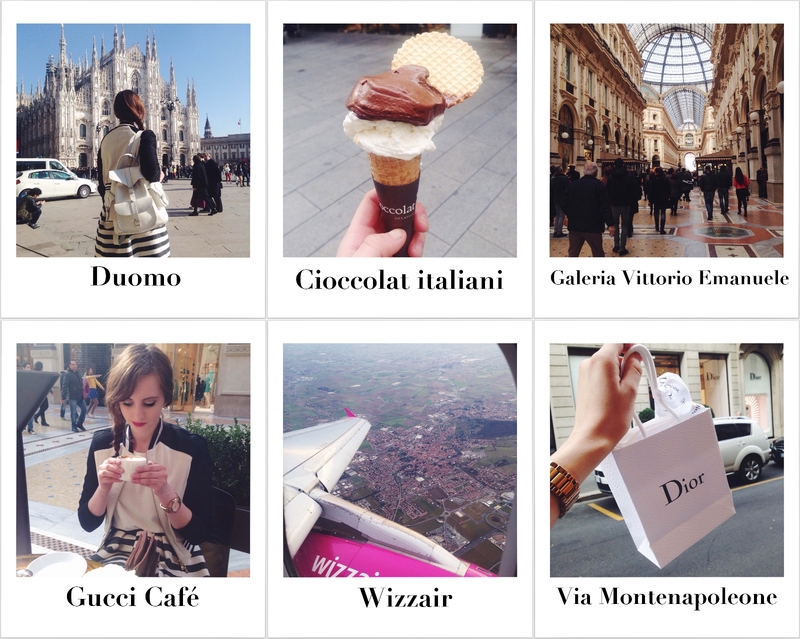 In Milan I can recommend Bianco Latte, Gucci Café, Café Cova and Café Miani Zucca. We spent a lot of time in Arnold Cafe in the centre, which is like an Italian Starbucks. I needed the internet connection very often and small cafes unfortunately didn’t offer it. V Miláně najdete kavárny a restauarace doslova na každém rohu. Asi víte, že miluji makronky, takže jsem nemohla vynechat své oblíbené Ladureé. V Miláně ho najdete na Via Spadari. Také jsme si nemohli nechat ujít pravé italské gelato. Zkusili jsme ho v Cioccolati italiani, kde ho můžu jen doporučit. Co se kaváren týče, doporučila bych Bianco Latte, Gucci Café, Café Cova a Café Miani Zucca. Hodně času jsme trávili také v Arnold Café, což je milánská verze Starbucks. Často jsme totiž potřebovali wifi, kterou většina kaváren nenabízela. Milan is an amazing city full of beautiful places to visit! Jak se to prosím s kufrem ve Wizzair? beautiful post and amazing city! !